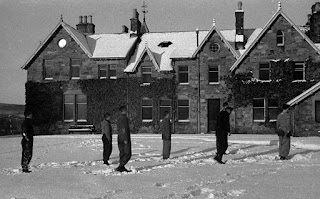 BBC Future shares the story of the unassuming retreat called Drumintoul Lodge in the Scottish highlands that during World War II was covert host to an international commando school under the auspices of the Special Operations Executive for resistance fighters from all countries threatened by the Axis powers, defectors and spies. The campus was particularly a good training ground to its contingent of Norwegian guerrillas that matriculated on this estate in the Cairngorms as the barren, wind-swept plateau was a lot like the native homeland that they sought to protect. The Norwegians trained in sabotage techniques which proved vital in ultimately preventing the Nazis from developing a nuclear bomb. Deuterium (heavy water) is needed to moderate fission reactions (it being less prone to strip away neutrons and enable a run-away reaction) so the detonation could be controlled and only one hydro-electric plant in the world was capable of producing heavy water at the time—in Nazi-occupied Norway. Raids that operatives trained for in Drumintoul were launched against the facilities at the base of the Rjukan waterfall in Telemark, which stopped production capability.